On Wednesday 27 May 2015 I visited Alaminos, a village in the South of Cyprus, which spans from the mountains to the sea. My father and I had met Aristos, the Mayor of Alaminos, in 2014, when I had explained my PhD research project to him and he had kindly agreed to help me. We met with Aristos again this year; he pulled a folder from his bookshelf with all of the paperwork I had given him last year – a folder dedicated solely to my PhD. Aristos is a bold, energetic and extremely enthusiastic character. As is often the case, the world can seem so small at times. Our family friend from Melbourne, Thanassi, was born in Alaminos and his father baptised Aristos! We had bumped into Thanassi on our flight from Melbourne – he was going to visit family in his village – and Thanassi joined us for a coffee and for the first Alaminos interview. My first interview was with Eleni. She was a strong and intelligent woman, who was also very thoughtful and gentle. She told me that she was the leader of the labourer’s union, fighting for wage rises and for worker’s rights, in Alaminos for many years. The union comprised men and women, Greek and Turkish Cypriots. She spoke of the days when milk-mothers were common in Cyprus. When a woman could not breast feed her own child, a friend or neighbour would breast feed the child for her. I first read about this practice in Yiannis Papadakis’ book “Echoes from the Dead Zone: Across the Cyprus Divide”, where he described the significant role of the “milk-mother”. Papadakis drew upon the example of a Turkish Cypriot woman who breastfed the child of a Greek Cypriot woman, who had fallen ill soon after giving birth to her son. Eleni said that one’s milk-mother was their second mother – someone who you treated as if she were your own mother, and whose children were like your siblings. She said that it was common in Alaminos for Greek and Turkish Cypriot women to take on this role for the children of the other group. Eleni said that the children fed by the milk mother – her own children and any others she fed – could not marry. This is how significant the role of the milk-mother was considered in the old days. Eleni grew up with many Turkish Cypriot friends. How did she feel when they left the village in 1974? “I was glad to see them go.” A Turkish military base had been stationed just 5 miles from Alaminos from 1963-1974. Initially both Greek and Turkish Cypriots were frightened of them; however; over the years, tension grew between Greek and Turkish Cypriots in the village, largely due to the presence of the Turkish military. Eventually, many relationships deteriorated. Amongst small mixed villages, I suspect that Alaminos was quite unusual in this regard. 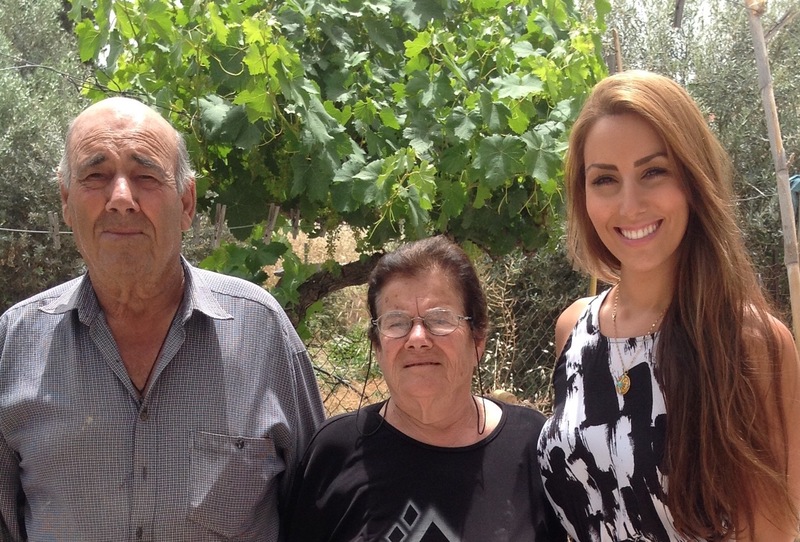 After the interview, my parents and I went to visit Thanassi’s family, who, like most Cypriots, were very hospitable. His brother-in-law suggested he take us to visit another elderly villager – Charalambos. Charalambos was out in the fields when we went to visit him; he stopped his work and came back home to greet us and agreed to do the interview there and then, with gumboots on and all! He told us that when he attended the Greek Cypriot school as a child, his teacher made it compulsory for all of the students to attend the Turkish Cypriot school for some months, primarily for Turkish language classes. Some of the Turkish Cypriot children would also attend the Greek Cypriot school. His identity was heavily hellenic. He fought with EOKA – a Greek-Cypriot nationalist guerrilla organisation that fought a campaign for the end of British rule in Cyprus and eventual union with Greece. However, he was caught and jailed by the British for 3 years. 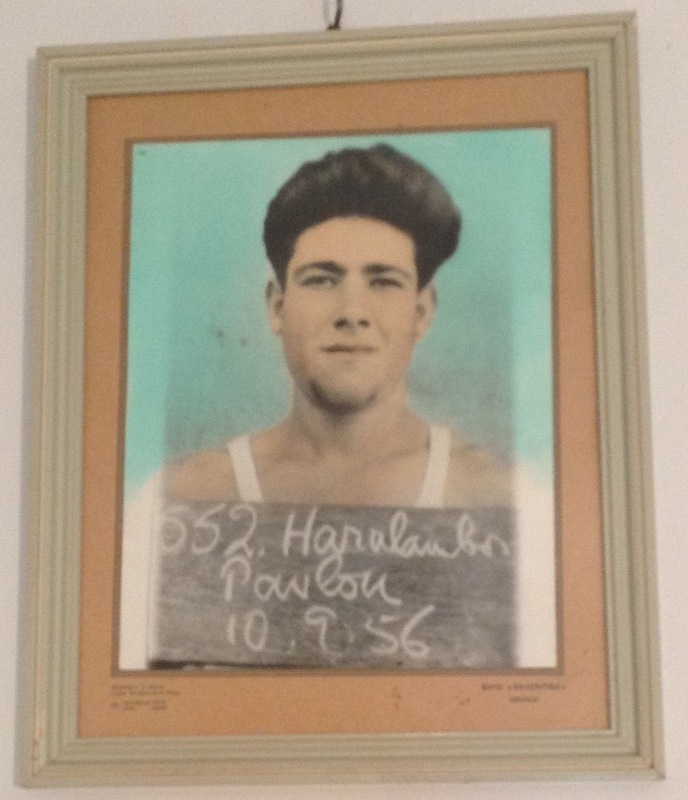 His mug-shot hangs proudly in his living room. He loved his Turkish Cypriot friends very much, although from 1963 relations were tense between the two groups in Alaminos. 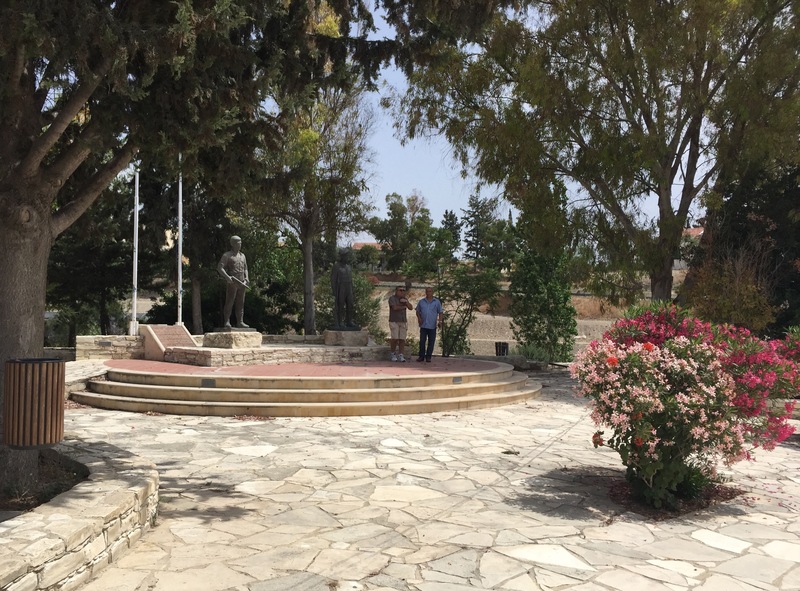 During the conflict which took place in 1974, he and two of his Greek Cypriot friends were shot by a Turkish Cypriot; he was the only one who survived.There is a memorial of the two men who died in the village. Charalambos was shot five times, three bullets grazed his scalp, one went through his torso and one remains lodged near his spine. Apparently the man who shot him was found and killed. Despite this, he feels no animosity towards the Turkish Cypriots; “It was a time of war,” he said. He blamed the Turkish soldiers, rather that the Turkish-Cypriots, for propagating the conflict. 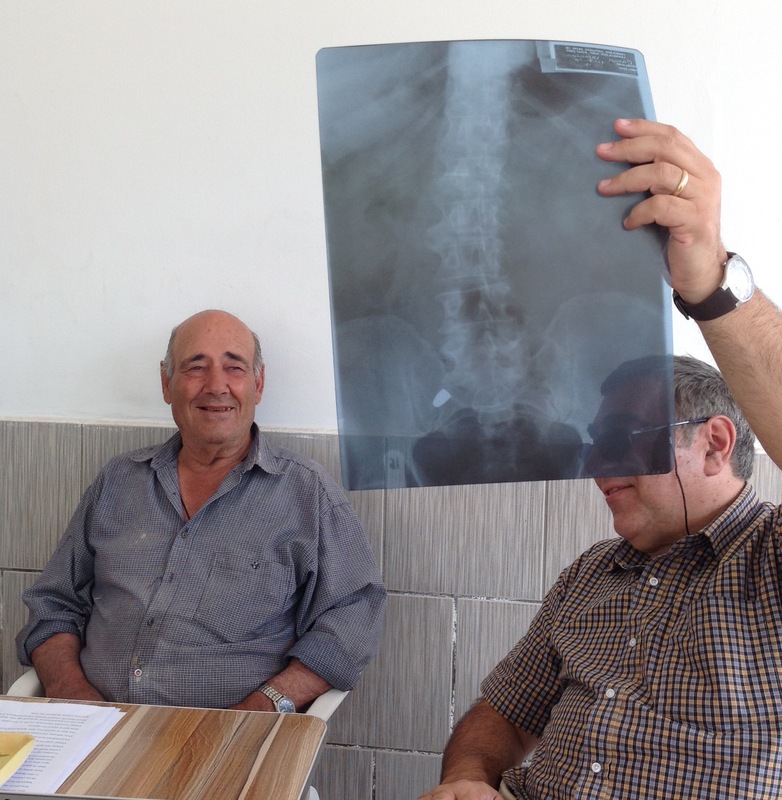 After the border opened in 2003, his best friend and his wife – who were Turkish Cypriot – came to visit him in Alaminos. They remembered him being shot all those years ago and wanted to check to see if he was OK. Since then, that friend has visited him many times, along with over 100 other Turkish Cypriot formerly from Alaminos. He has maintained contact with his Turkish Cypriot friends since the 1974 conflict by letter and telephone and, to this day, he still feels incredibly loved and respected by his Turkish Cypriot friends. To our surprise, Charalambos’s wife Ioanna had prepared lunch for us: home-made bread, sardines, watercress and beans from their own garden, drenched in oil from their own olive trees …. a beautiful, healthy and classic Cypriot village meal.